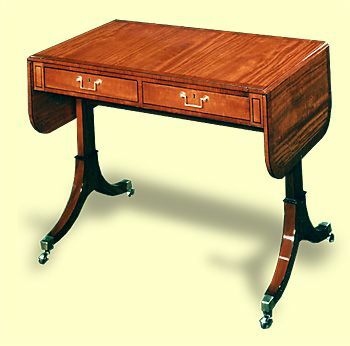 A wood of choice in the late eighteenth century, satinwood, is yellow in tone and has a rich figure. The Sheraton style satinwood sofa gaming table has a leathered backgammon board and reversible top with inlaid walnut and satinwood chessboard. The piece is crossbanded in rosewood and has silver plated drawer pulls and casters. Rich is the word for the impression created by this piece. Also available in mahogany.